Silver and Gold for Christmas Portrait Session! 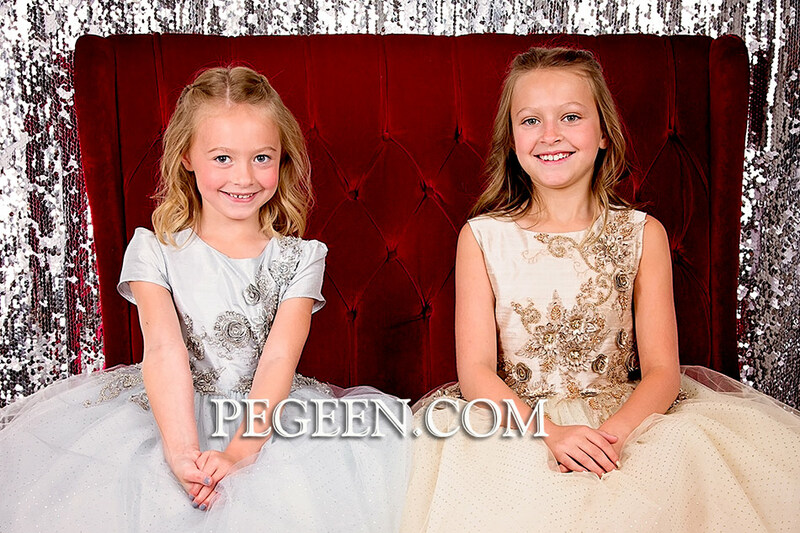 August 9, 2016 / Christmas Dresses, FEATURED FLOWER GIRL DRESSES, Gold Flower Girl Dresses / Comments Off on Silver and Gold for Christmas Portrait Session! 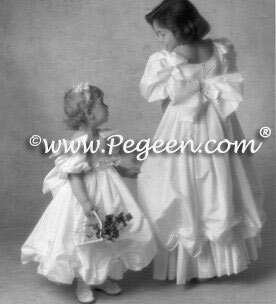 We are very excited to present this absolutely stunning addition to our Pegeen Fairy Tale Collection and have named it, what else, The Princess Fairy. When our head designer first saw this fabric, she went absolutely ga-ga! 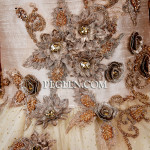 “Between the rhinestones, the embroidery, the beads and the 3-dimentional embroidery, I couldn’t wait until our order arrived. In fact, I asked them to express the fabric in so I could have it in the studio when I get back the next day! I knew EXACTLY how to make this fabric be seen at it’s best. 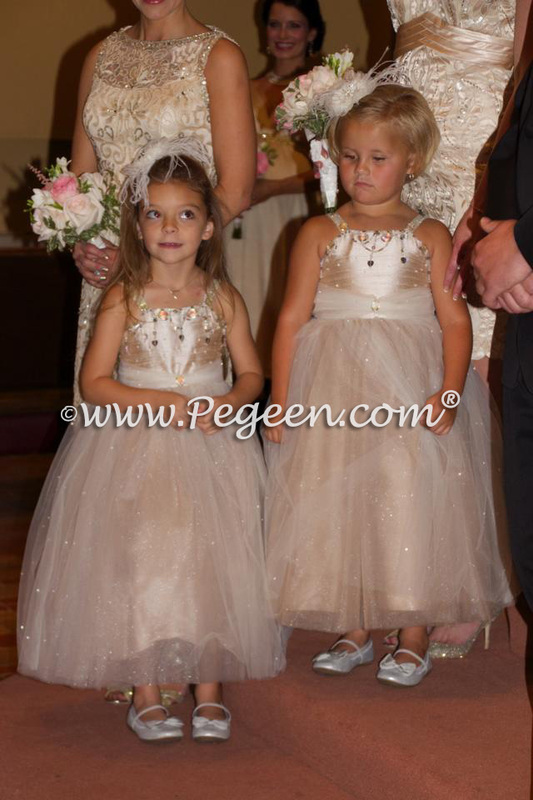 This flower girl dress is made of 100% pure silk, ten layers of tulle covered with a layer of glitter tulle in gold or silver, and on the bodice, the most incredible beading, rhinestones, embroidery and 3 dimensional flowers, all hand placed and hand sewn with each dress uniquely different than another. 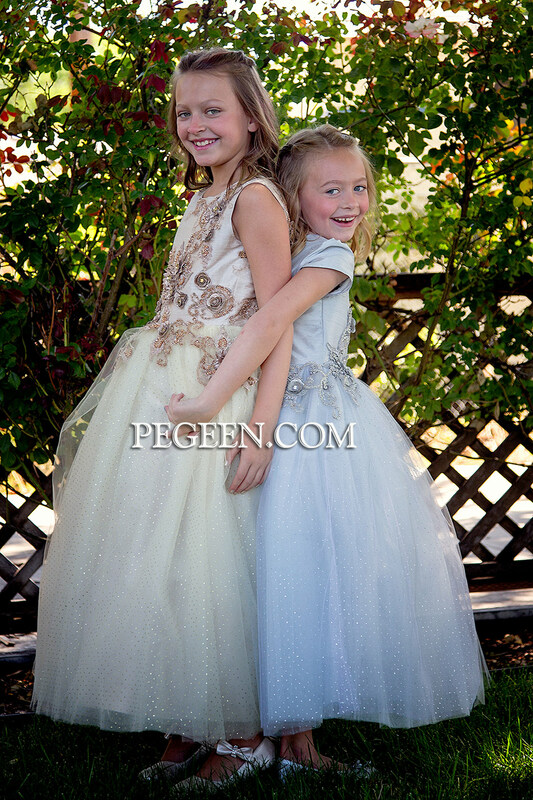 See all images for this photo shoot by Donna G Photography @BoxerStudios where the mom chose these flower girl dresses for her two daughters’ Christmas Dresses. This beautiful gold and white wedding was captured by Danielle Davis Photography. 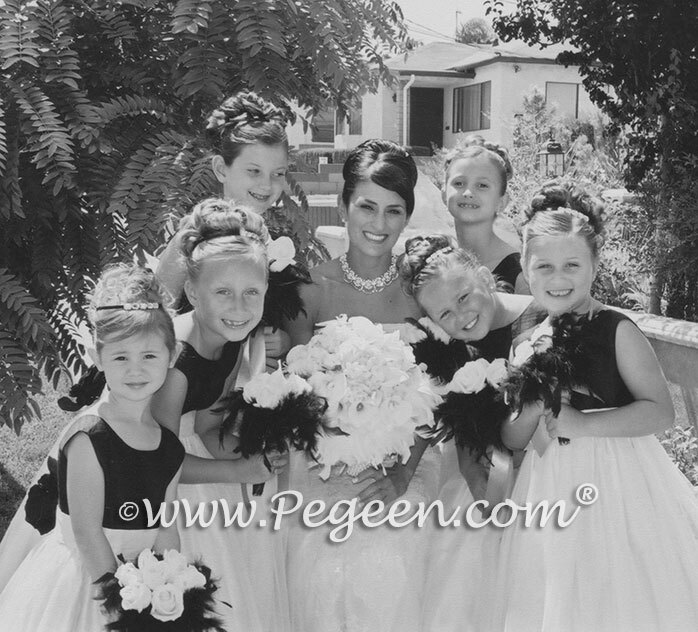 Our customer chose Pegeen flower girl dress style 300 in New Ivory flower girl dresses with pale gold silk sashes. 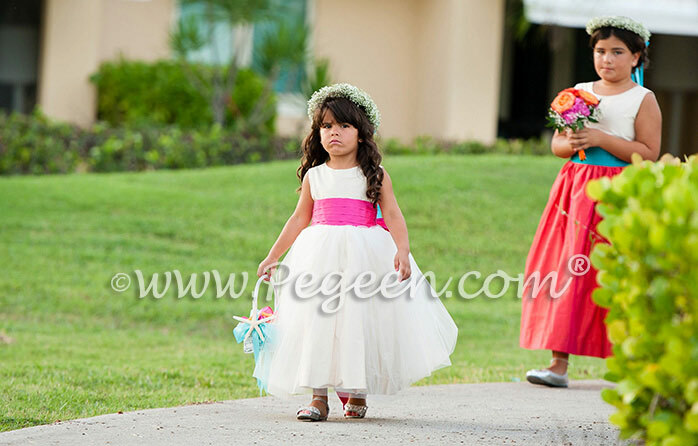 We loved the flower girl wreaths and the flowers that adorned the church pews! 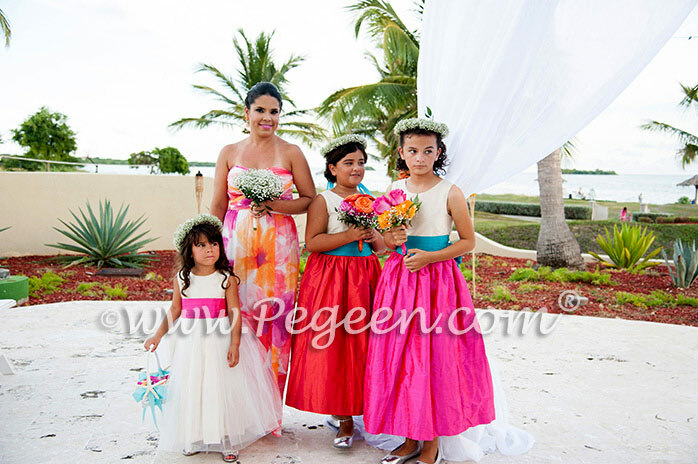 We see she used ivory, peach, pink and deep red in all of her flowers with lots of greenery! Thought the flowers by Tanarah Luxe Florals were outstanding. I had SO much fun this past weekend! 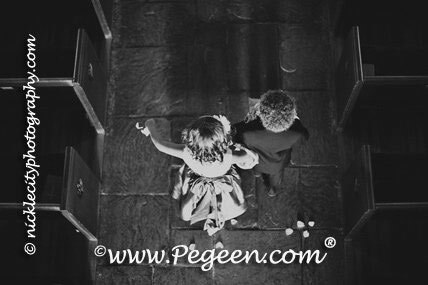 I went to a family wedding, and boy was it a shindig. My sister’s family (lives in Indiana) transported our “mostly from NJ” and the Kentucky family of the fiance, now wife of my nephew, into a different time and age. 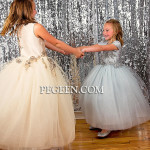 I will post more images later as I plan to cover the wedding details in full (starting with a transformed “Gatsby” themed rehearsal party), but I had to talk about the flower girl dresses that I was SO proud of my seamstresses that produced truly a spectacular and wonderful Swarovski encrusted, silk and tulle, vintage feeling Tulle Flower Girl Dress from the Fairytale Collection, our “Topaz” Style 904. I can’t remember for sure but I estimate that there are close to 800 or so crystals on that dress, which is a lot of handwork. 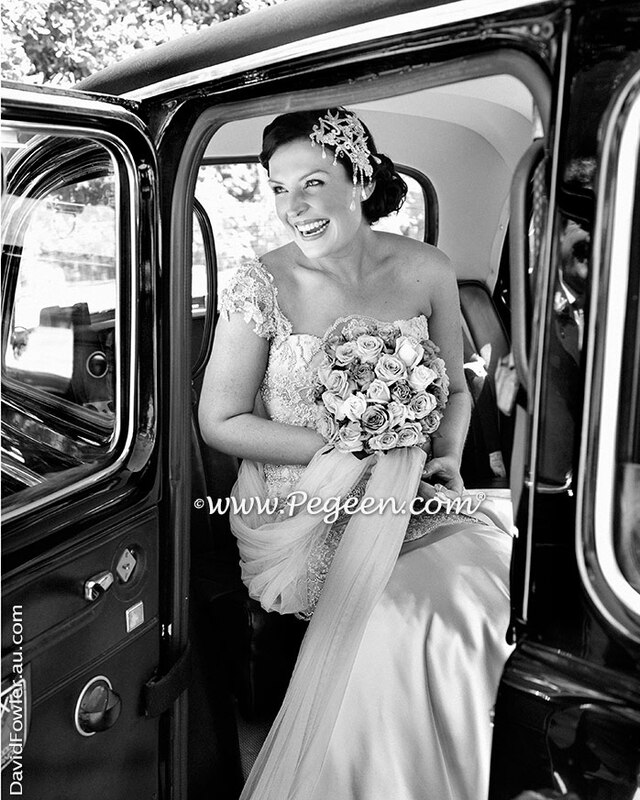 Yes I admit – it is the most expensive dress that we have produced but after I saw all the dresses the bridesmaids wore and this SPECTACULAR wedding gown (the first one actually) and veil with all of their crystals, I know the bride chose the right flower girl dresses that we gave as their presents. (Part of the perks of having a designer in the family, I suppose). So, now that my “niece-daughter” has announced her engagement, she asked me to do her gown. I was pretty hesitant before, but I am “in” on it now! Jessica – let’s do two! For those of you that have seen these images on Facebook, please indulge me on the duplicate post.